A new recording of world premieres addressing a topic of our national discourse: diaspora. If There Were Water is a testament to the expressive range of the human voice. 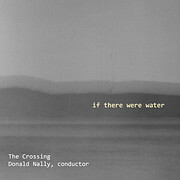 These two strikingly diverse, yet equally compelling unaccompanied compositions were commissioned for The Crossing’s Month of Moderns festival and premiered in June 2017. Drawing from literary and historic sources, the works are highly personal reflections that speak with clarity to contemporary concerns of displacement, while weaving together past and present.